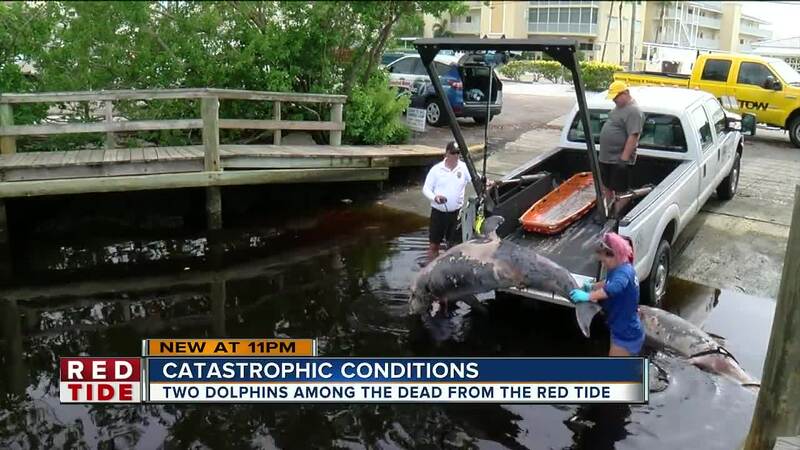 VENICE, Florida — Six dolphins were found dead on beaches in Sarasota County in the past 24 hours. "The fact that it's starting to impact our dolphins makes us even more nervous about what's to come," said Rebeccah Hazelkorn, senior biologist at Mote Marine. Venice Police Marine Patrol found two deceased dolphins on Tuesday, another two on Wednesday around 8 a.m. and then two more around 2:30 p.m.
"Dolphins are much faster-moving animals. They have been able to detect it and swim out of it. Turtles are actually pretty good at detecting red tide and avoiding it. It's just where the animals are going and how bad the bloom is and how fast it gets into their system," said Hazelkorn. Mote Marine Aquarium's Stranding Investigations Program says it recovered those dolphins. Those deceased dolphins were discovered in several locations in Sarasota County including one found in the Intracoastal Waterway near Snake Island in Venice and another located on Caspersen Beach. We spoke with neighbors who found two of the dolphins stranded on Casey Key in Nokomis. "Its fin was up. I didn't know whether or not it was a shark or even a small whale. As I got closer, I realized it was a dolphin," said resident Jeanne May. The aquarium says three of the dolphins are males, the other three are females. Mote staff will conduct necropsies on the animals in Sarasota to investigate what happened to them. They were all reportedly found moderately to severely decomposed, which makes it difficult to examine and collect samples for analysis. Mote did not say whether or not red tide played a role in their deaths, but it has been impacting marine life on the Florida Gulf Coast this summer.